One of the largest personas from Bill Clinton's administration has died on the eve of the election that could see Hillary Clinton take the White House. 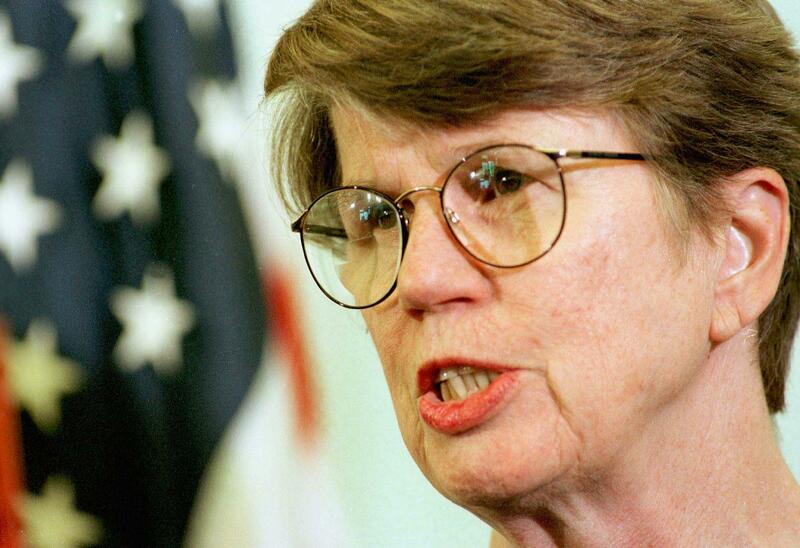 The first woman attorney general of the United States Janet Reno passed away early Monday, her goddaughter told The Associated Press. The goddaughter, Gabrielle D'Alemberte, explained to the AP that she died of complications from Parkinson's Disease. Reno was 78. In recent years — ever since her failed 2002 run for Florida governor — Reno has largely stayed out of the public eye, but she was one of the best known and most polarizing figures from the Bill Clinton administration. She served his entire eight years, from 1993 to 2001 — the longest serving attorney general since 1829. Among the cases she is best remembered for is the 1993 Waco, Texas siege and raid. After months of standoff, there was a deadly raid on a compound of religious extremists that were suspected of child abuse, polygamy, and stockpiling weapons; some 80 people died when the compound caught on fire. The other key case came at the end of her tenure. It was the Cuba-Florida custody battle for Elian Gonzalez. He was a five-year-old boy from Cuba who was found clinging to an inner tube in the Florida Straits in November 1999. His mother drowned during the journey. As such, immigration officials placed him with relatives in Miami. But his father, who was still in Cuba wanted the boy brought back home. The battle played out for months in the courts and on TV news. Gonzalez was eventually forcibly removed by federal agents and returned to Cuba. The Gonzalez case would come back to hurt her when she ran for governor but lost in the primary to another Democrat. Reno was Clinton's third choice for attorney general. The other two were also women, but were found to have hired illegal immigrants as nannies and weren't confirmed. Reno was confirmed by the Senate in a 98-0 vote. "It is an extraordinary experience, and I hope I do the women of America proud,” Reno said after confirmation, the AP reported. From the beginning she was hard at work. The Waco raid would come just months later, and her Parkinson's diagnosis just years, in 1995. She shared the news during a weekly news conference, claiming it would not affect her job performance. Reno was born in Miami in 1938 and attended Cornell University before going on to study at Harvard Law School. She then went back to Florida and worked there first in a private practice and then as Dade County prosecutor from 1978 to 1993. It was only her appointment by Clinton that brought her national prominence. Since she lost the bid for governor, she has only made news a handful of times. In 2004 she testified for the 9/11 Commission regarding suggestions she had made about information sharing among government intelligence agencies, and specific recommendations she made to the FBI which may not have been carried out. She also wrote a friend-of-the-court brief in 2006 criticizing the Bush administration's anti-terror strategy. Reno may not have lived to see the first woman president elected, but her contribution to the country should not be forgotten.